Those 4-month old babies sure are cute but they can wreak havoc on mommy and daddy’s sleep! BIG biological changes: their circadian rhythm starts to form. And, they can become overstimulated by the world around them. So, the real issue is that what worked for them as newborns, suddenly might not work anymore. 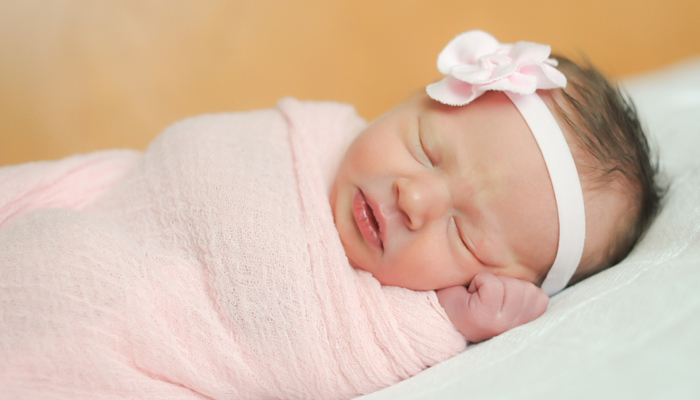 Your sweet baby may go from sleeping long stretches at night to waking every hour or two and parents feel helpless. Wait out the regression. If your child was a champ-sleeping newborn, they might settle more easily in a couple of weeks. Experiment with alternative soothing methods and schedule tweaks. If this regression is causing exhaustion, stress, and frustration, it’s probably not going to work to wait it out for several weeks. Start aligning your baby to the clock and not just watching for sleepy cues. After all, your sleepy newborn has grown into an alert and active infant, who many not show the same sleepy cues. Start with a “wake time” for the day. Have your baby up by 7:00 am. If they are continuously sleeping past this time, it may feel glorious, but it likely means your baby is making up for lost night sleep. Set up a nap schedule. 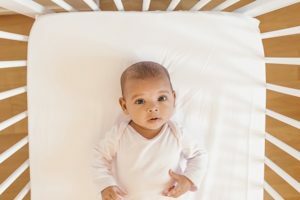 4-month old’s will start transitioning to a 3-nap schedule (approximately 9, 12, 3:30), however most struggle with short naps so they may need 4 naps initially. Set night feeding times. Babies around 4 months of age usually do well with 0-2 night feedings. Of course, each baby is different and you should consult with your pediatrician. However, if you are nursing your baby to sleep each time they awaken, they are either taking in too many nighttime calories or using this as a pacifier. Move bedtime earlier. You were probably used to your newborn going to bed late at night. This is a great age to move bedtime earlier, like 6-8 pm. Introduce a consistent sleeping place. If your goal is to have your baby sleeping in their crib in their own room, now is the time to make sure all naps and night sleep are in their crib. 4-month olds are a little less portable than the newborn who would sleep on-the-go. Teach self-soothing. Most 4-month old babies have never been given the chance to learn how to fall asleep independently. We spend their newborn period nursing, rocking, bouncing, and swinging to sleep. Decide on a gentle method and be consistent with your approach. Each awakening respond the same way for at least 4 nights. This could be: shushing, patting, verbal reassurances, timed checks, picking up and putting back down, etc. The key to any of these approaches should be that you do not actually put your baby to sleep; you coach them through the process and let them do the hard part of falling asleep independently. If you feel like you’ve tried it all and you’re still frustrated and exhausted, it’s probably time to call in the big dogs: the sleep coach!